This article helps you find and correct the problems that occur due to Secure Shell (SSH) errors, SSH connection failures, or SSH is refused when you try to connect to a Linux virtual machine (VM). You can use the Azure portal, Azure CLI, or VM Access Extension for Linux to troubleshoot and resolve connection problems. After each troubleshooting step, try reconnecting to the VM. Reset the credentials for the user. Verify the network security group rules permit SSH traffic. Ensure that a Network Security Group rule exists to permit SSH traffic (by default, TCP port 22). You cannot use port redirection / mapping without using an Azure load balancer. Check the VM resource health. Ensure that the VM reports as being healthy. If you have boot diagnostics enabled, verify the VM is not reporting boot errors in the logs. Continue reading for more detailed troubleshooting steps and explanations. Azure portal - great if you need to quickly reset the SSH configuration or SSH key and you don't have the Azure tools installed. Azure VM Serial Console - the VM serial console will work regardless of the SSH configuration, and will provide you with an interactive console to your VM. In fact, "can't SSH" situations are specifically what the serial console was designed to help solve. More details below. Azure CLI - if you are already on the command line, quickly reset the SSH configuration or credentials. If you are working with a classic VM, you can use the Azure classic CLI. 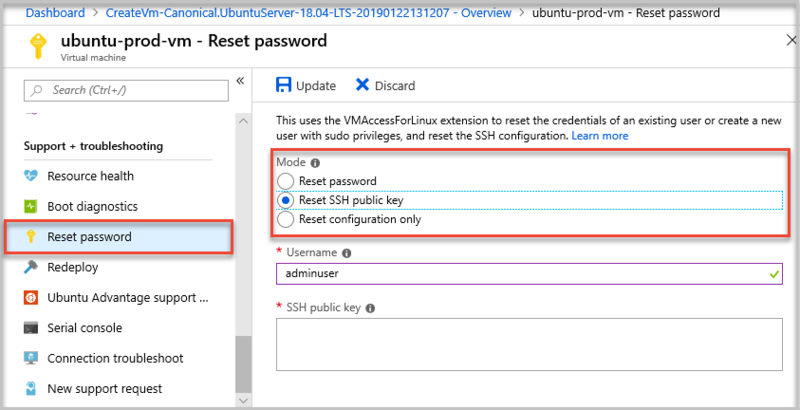 Azure VMAccessForLinux extension - create and reuse json definition files to reset the SSH configuration or user credentials. After each troubleshooting step, try connecting to your VM again. If you still cannot connect, try the next step. The Azure portal provides a quick way to reset the SSH configuration or user credentials without installing any tools on your local computer. To reset the SSH configuration, select Reset configuration only in the Mode section as in the preceding screenshot, then select Update. Once this action has completed, try to access your VM again. To reset the credentials of an existing user, select either Reset SSH public key or Reset password in the Mode section as in the preceding screenshot. Specify the username and an SSH key or new password, then select Update. You can also create a user with sudo privileges on the VM from this menu. Enter a new username and associated password or SSH key, and then select Update. Use IP flow verify to confirm if a rule in a network security group is blocking traffic to or from a virtual machine. You can also review effective security group rules to ensure inbound "Allow" NSG rule exists and is prioritized for SSH port (default 22). For more information, see Using effective security rules to troubleshoot VM traffic flow. Use Network Watcher's Next hop capability to confirm that a route isn't preventing traffic from being routed to or from a virtual machine. You can also review effective routes to see all effective routes for a network interface. For more information, see Using effective routes to troubleshoot VM traffic flow. The Azure VM Serial Console provides access to a text-based console for Linux virtual machines. You can use the console to troubleshoot your SSH connection in an interactive shell. Ensure you have met the prerequisites for using Serial Console and try the commands below to further troubleshoot your SSH connectivity. If there is any output, SSH is up and running. If you haven't already, install the latest Azure CLI and sign in to an Azure account using az login. If you created and uploaded a custom Linux disk image, make sure the Microsoft Azure Linux Agent version 2.0.5 or later is installed. For VMs created using Gallery images, this access extension is already installed and configured for you. The VM Access Extension for Linux reads in a json file that defines actions to carry out. These actions include resetting SSHD, resetting an SSH key, or adding a user. You still use the Azure CLI to call the VMAccess extension, but you can reuse the json files across multiple VMs if desired. This approach allows you to create a repository of json files that can then be called for given scenarios. The SSHD configuration itself may be misconfigured or the service encountered an error. You can reset SSHD to make sure the SSH configuration itself is valid. Resetting SSHD should be the first troubleshooting step you take. If you have reset the SSH configuration and user credentials, or encountered an error in doing so, you can try restarting the VM to address underlying compute issues. You can redeploy a VM to another node within Azure, which may correct any underlying networking issues. For information about redeploying a VM, see Redeploy virtual machine to new Azure node. After this operation finishes, ephemeral disk data is lost and dynamic IP addresses that are associated with the virtual machine are updated. Try these steps to resolve the most common SSH connection failures for VMs that were created by using the classic deployment model. After each step, try reconnecting to the VM. Restart the VM. On the Azure portal, select your VM and select Restart. Redeploy the VM to a new Azure node. For information about how to redeploy a VM, see Redeploy virtual machine to new Azure node. After this operation finishes, ephemeral disk data will be lost and dynamic IP addresses that are associated with the virtual machine will be updated. Reset the password or SSH key. Create a sudo user account. Check the VM's resource health for any platform issues. Select your VM and scroll down Settings > Check Health. If you are still unable to SSH to your VM after following the after steps, see more detailed troubleshooting steps to review additional steps to resolve your issue. For more information about troubleshooting virtual machines that were created by using the classic deployment model, see How to reset a password or SSH for Linux-based virtual machines.